??/? 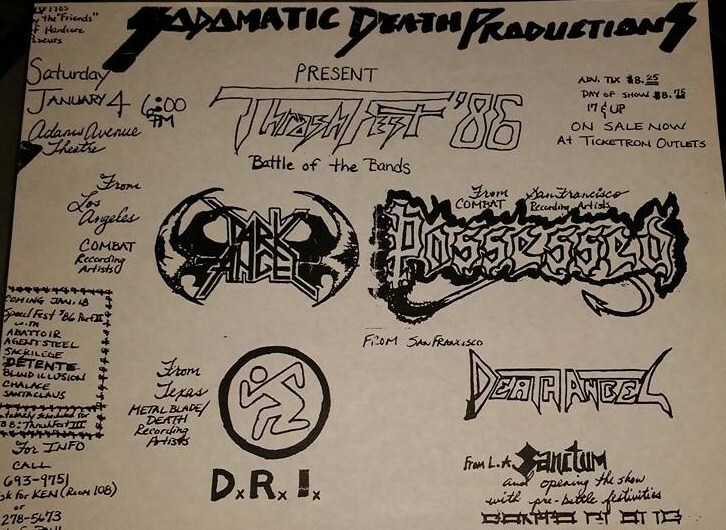 ?/1984; 'Death Metal' demo released. 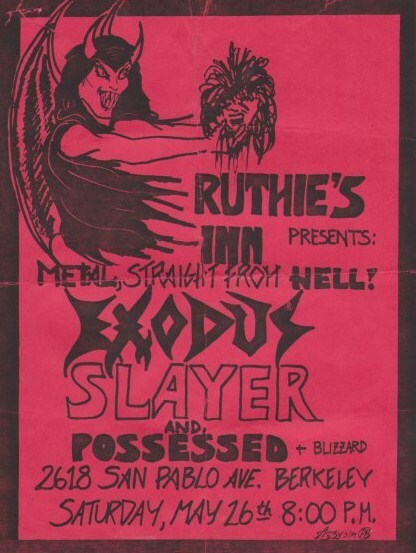 26/05/1984; Concert at Ruthie's Inn, San Francisco, CA, USA. opening for Slayer & Exodus. 15/06/1984; Concert at Ruthie's Inn, San Francisco, CA, USA. 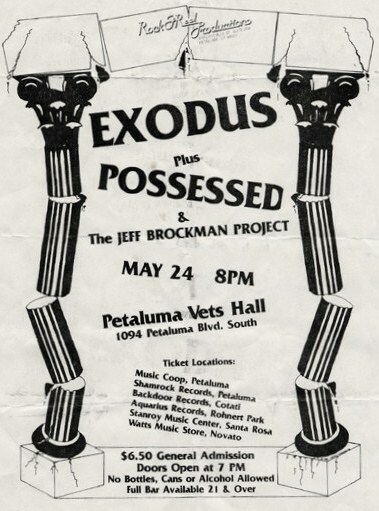 opening for Exodus. 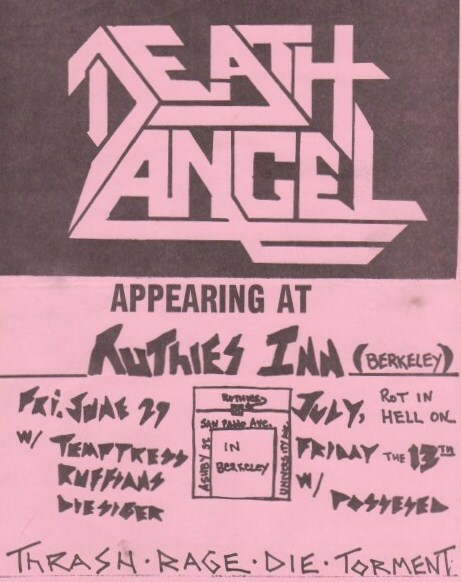 23/06/1984; Concert at Ruthie's Inn, San Francisco, CA, USA. opening for Slayer & Exodus. 13/07/1984; Concert at Ruthie's Inn, San Francisco, CA, USA. with Death Angel. 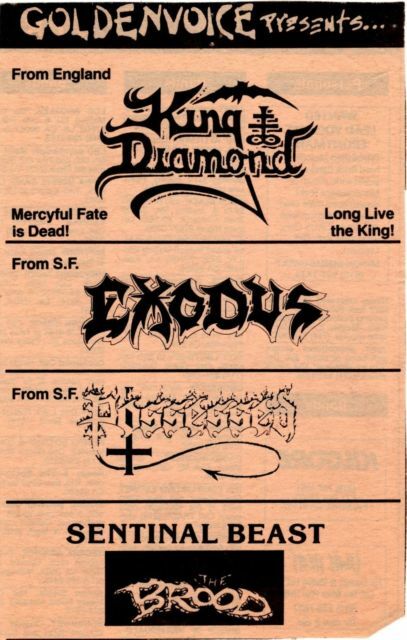 21/09/1984; Concert at Ruthie's Inn, San Francisco, CA, USA. 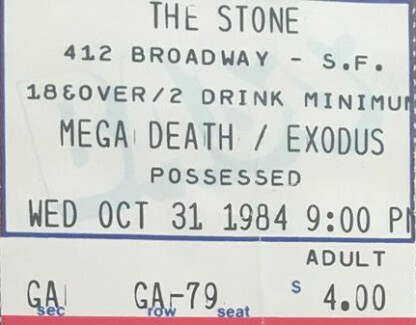 31/10/1984; Concert at The Stone, San Francisco, CA, USA. 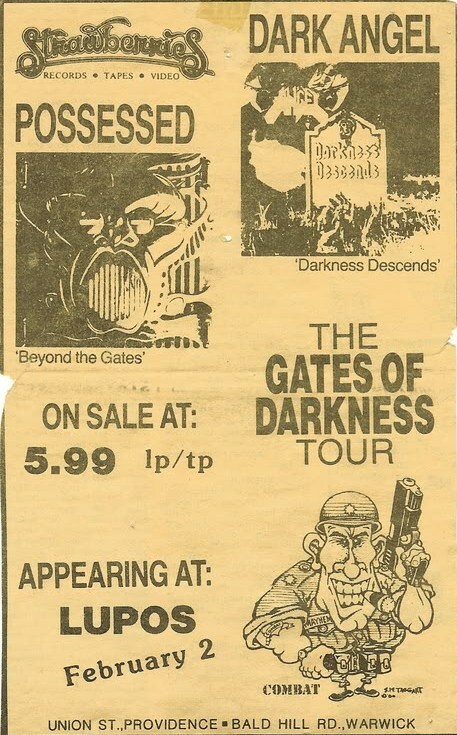 opening for Exodus & Megadeth. 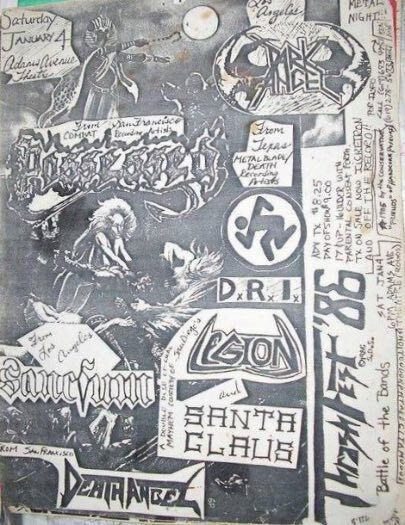 28/12/1984; Concert at Ruthie's Inn, San Francisco, CA, USA. 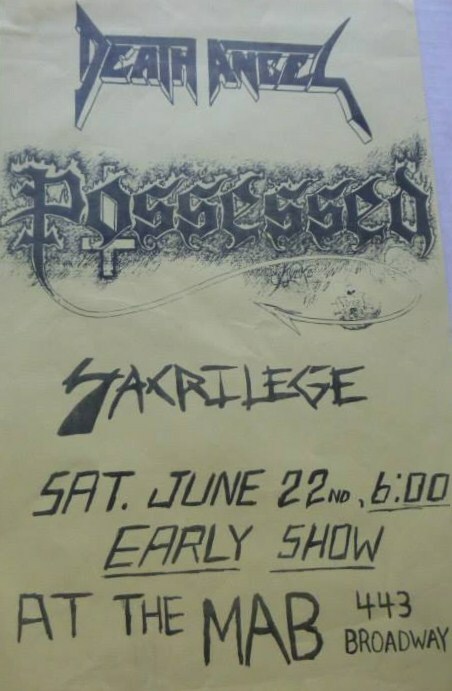 opening for Stone Vengance & Possessed. (unsure of year). 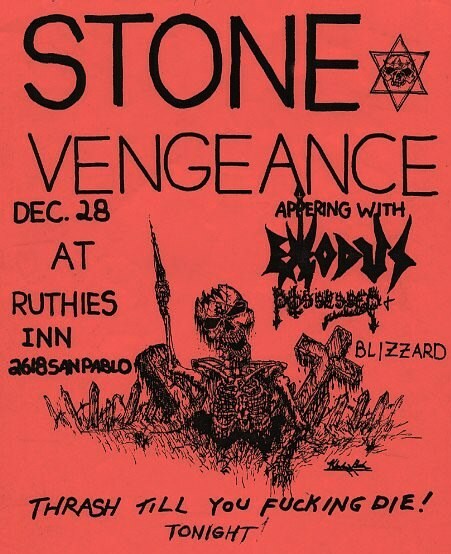 31/12/1984; Concert at Ruthie's Inn, San Francisco, CA, USA. 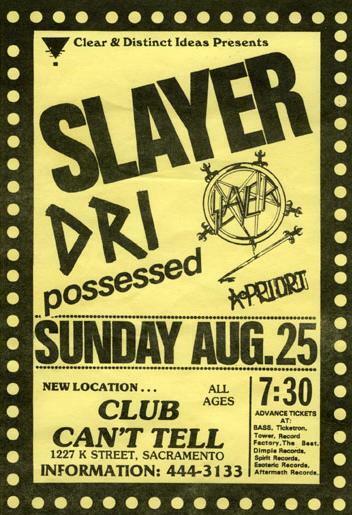 opening for Slayer. 04/01/1985; Concert at Ruthie's Inn, San Francisco, CA, USA. opening for Legacy & Death Angel. 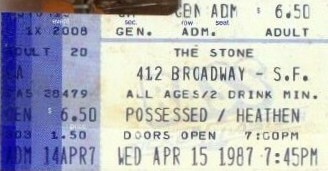 05/01/1985; Concert at The Stone, San Francisco, CA, USA. 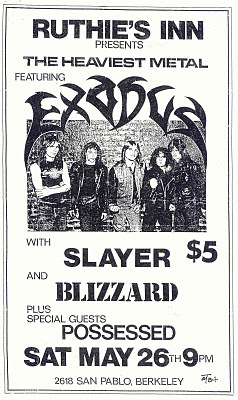 opening for Exodus & Death Angel. 25/01/1985; Concert at The Sun Valley Lodge, Sun Valley, CA, USA. 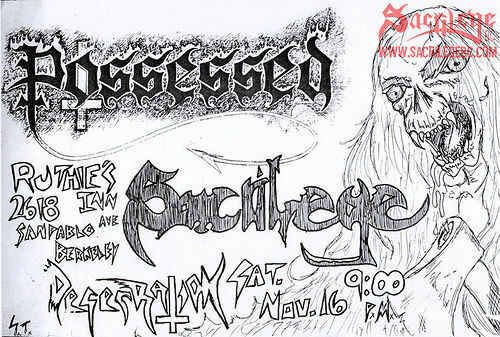 opening for Savage Grace, C.O.C. & Dark Angel. 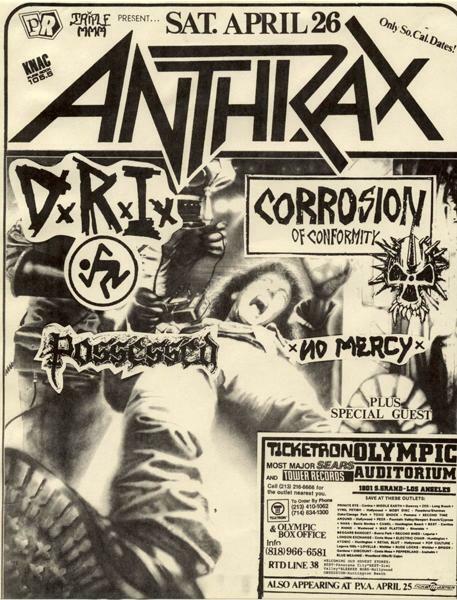 26/01/1985; Concert at Radio City, Anaheim, CA, USA. 01/02/1985; Concert at Ruthie's Inn, San Francisco, CA, USA. 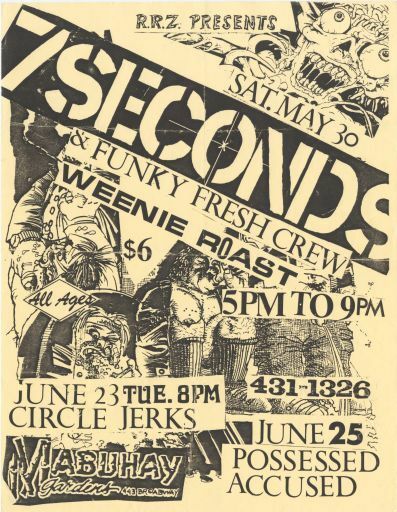 opening for C.O.C., with Blast & asst. 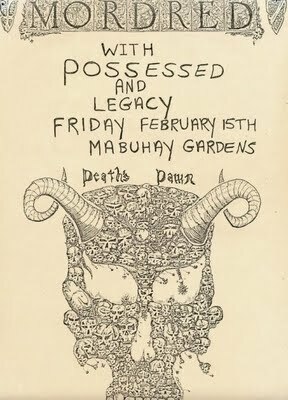 15/02/1985; Concert at Mabuhay Gardens, San Francisco, CA, USA. opening for Mordred & Legacy. 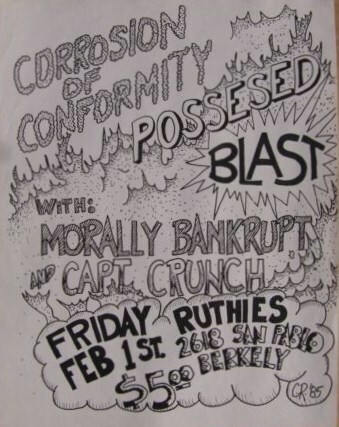 15/02/1985; Concert at Ruthie's Inn, San Francisco, CA, USA. 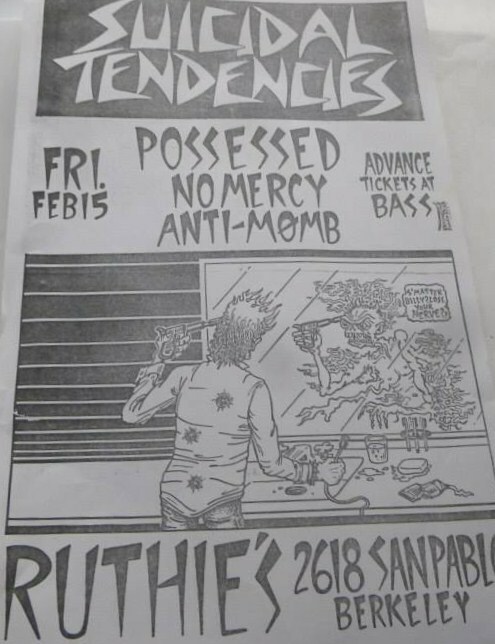 opening for Suicidal Tendencies, with No Mercy & Anti-Momb. 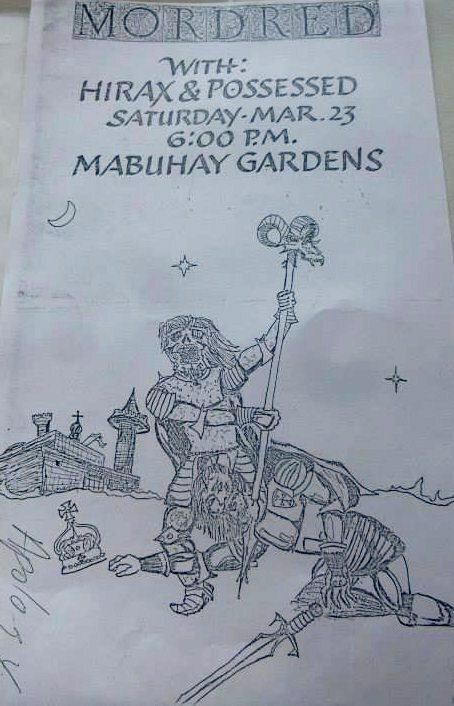 (possibly cancelled). 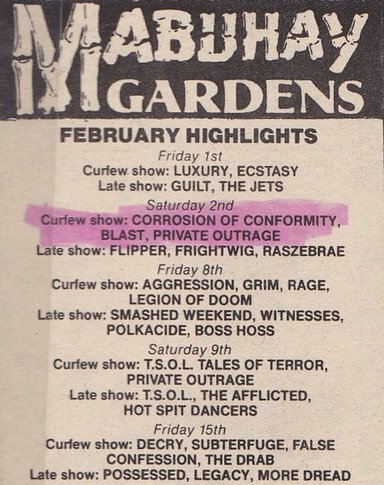 23/02/1985; Concert at Mabuhay Gardens, San Francisco, CA, USA. 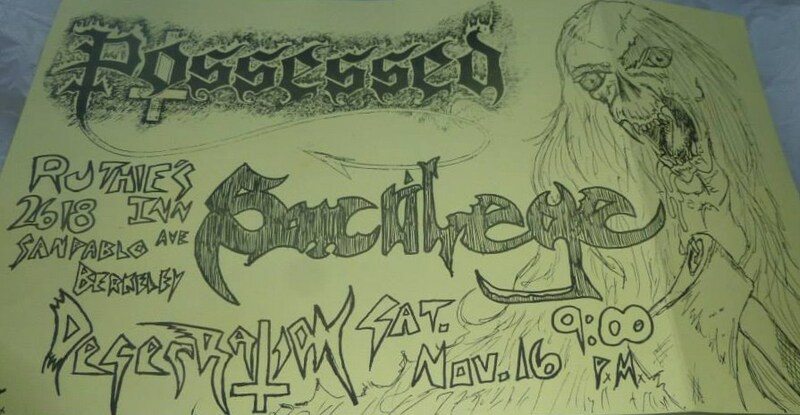 opening for Death Angel, with Legacy. 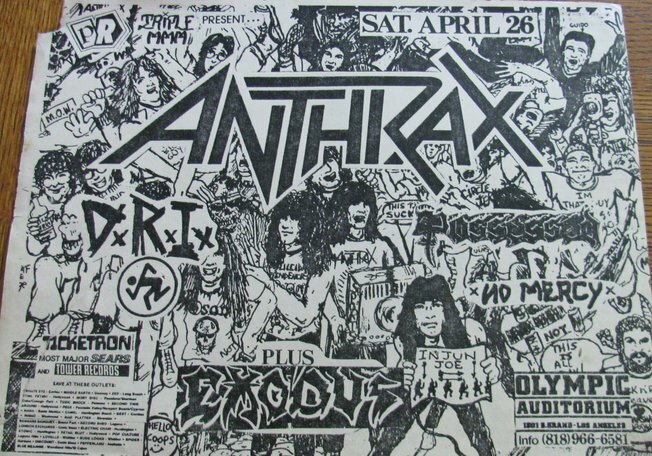 22/03/1985; Concert at ??, ? ?, USA. 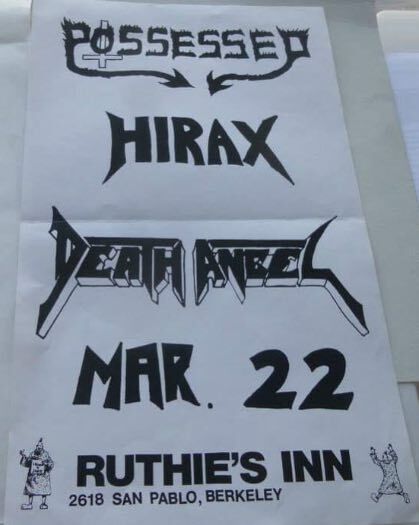 with Death Angel & Hirax. 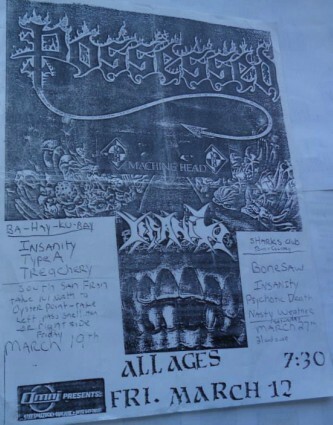 23/03/1985; Concert at Mabuhay Gardens, San Francisco, CA, USA. 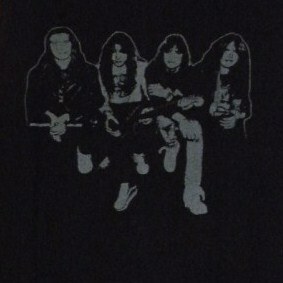 with Mordred & Hirax. 12/04/1985; Concert at The Kabuki Nightclub, San Francisco, CA, USA. opening for Venom. 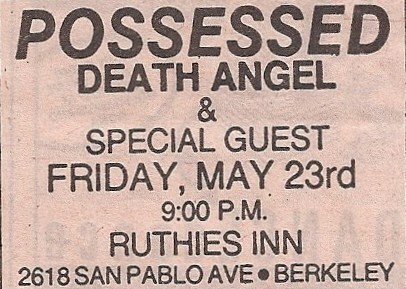 27/04/1985; Concert at Ruthie's Inn, San Francisco, CA, USA. 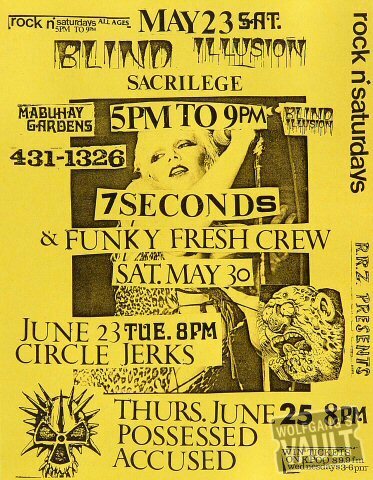 22/06/1985; Concert at Mabuhay Gardens, San Francisco, CA, USA. 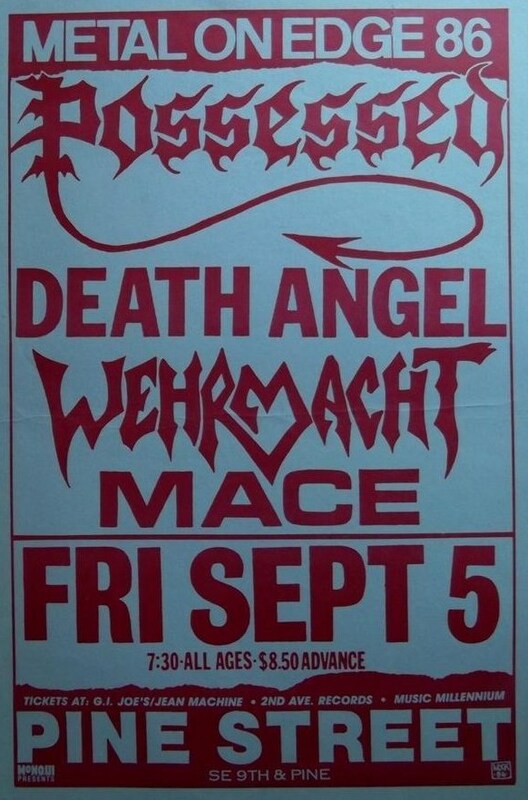 opening for Death Angel, with Sacrilege. 26/07/1985; Concert at The Henry J. Kaiser Centre, Oakland, CA, USA. 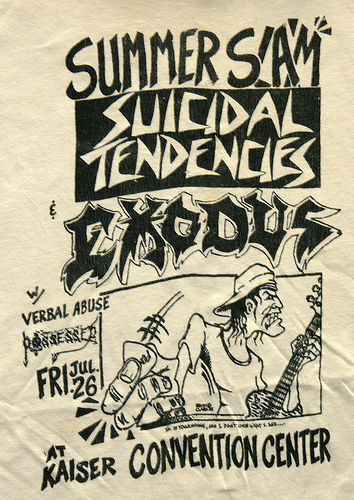 opening for Suicidal Tendencies & Exodus. 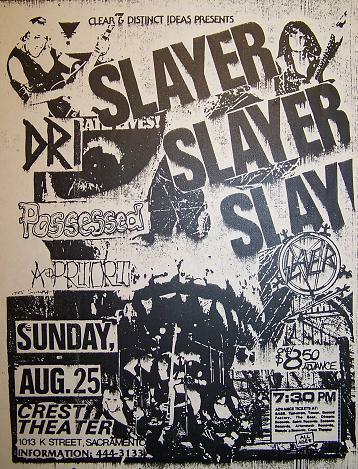 25/08/1985; Concert at The Crest Theatre, Sacremento, CA, USA. 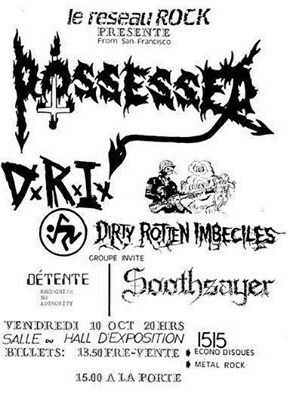 opening for Slayer & D.R.I. 27/08/1985; Concert at The Starry Night, Portland, OR, USA. 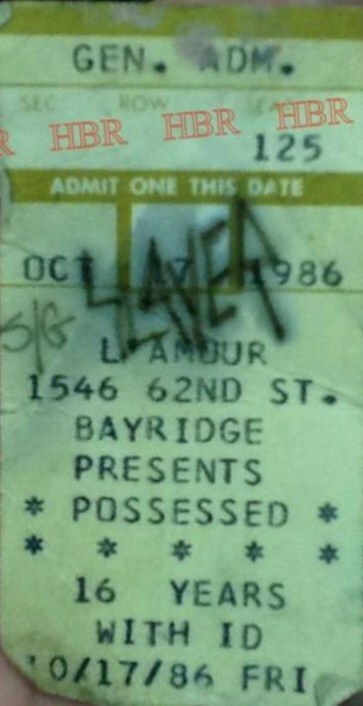 opening for Slayer. 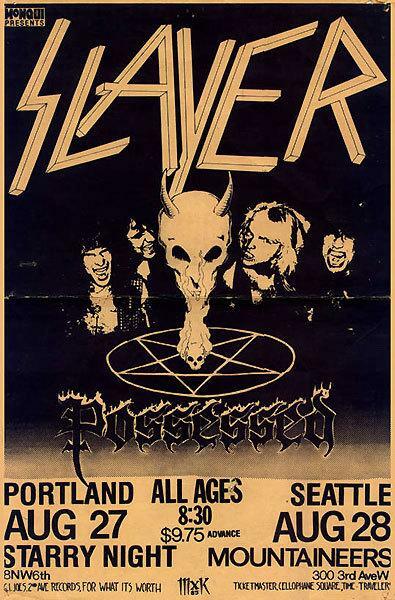 28/08/1985; Concert at The Mountaineers, Seattle, WA, USA. opening for Slayer. 07/09/1985; Concert at Ruthie's Inn, San Francisco, CA, USA. 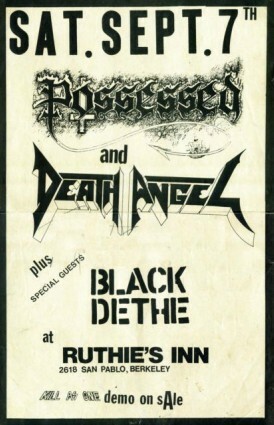 with Death Angel & Black Dethe. 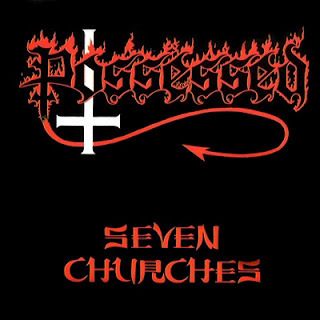 16/10/1985; 'Seven Churches' album released. 16/11/1985; Concert at Ruthie's Inn, San Francisco, CA, USA. 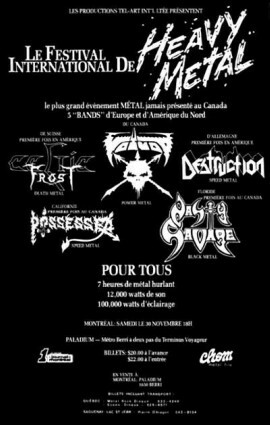 30/11/1985; Concert at The Paladium, Montreal, ON, Canada. 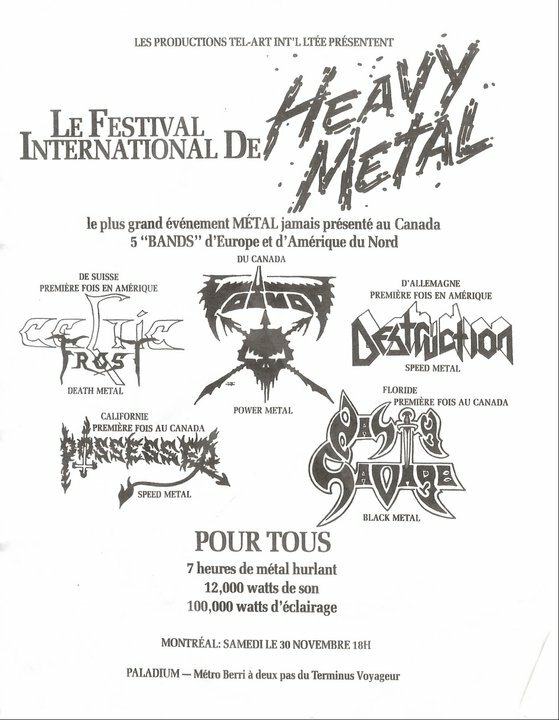 opening for Voivod, Celtic Frost etc. 'World War III' event. 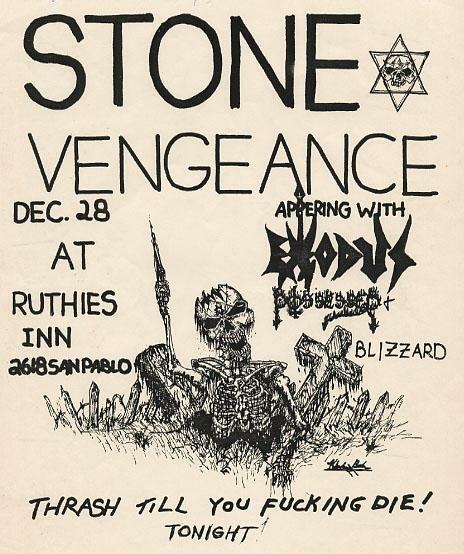 14/12/1985; Concert at Ruthie's Inn, San Francisco, CA, USA. 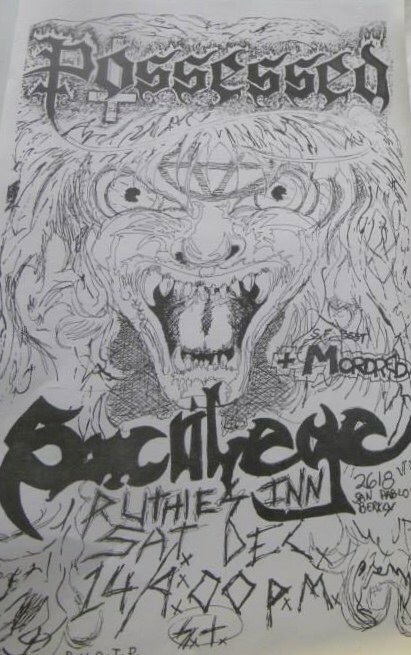 with Sacrilege & Mordred. 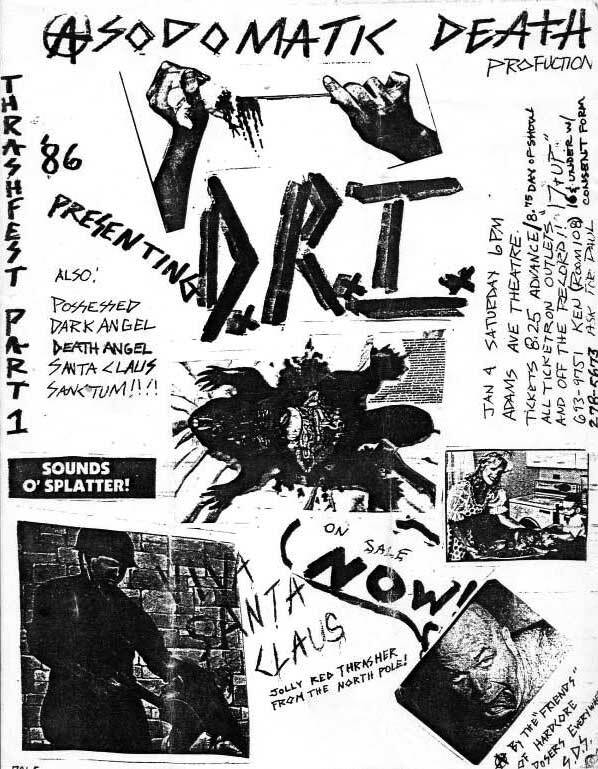 29/12/1985; Concert at Fenders Ballroom, Long Beach, CA, USA. 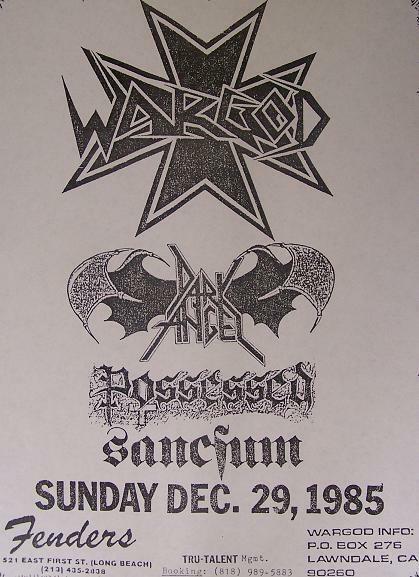 opening for Dark Angel, with Wargod. 03/01/1986; Concert at The Balboa Theater, San Francisco, CA, USA. 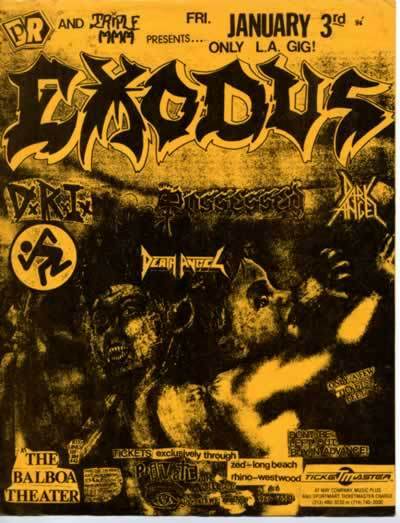 opening for Exodus, D.R.I. 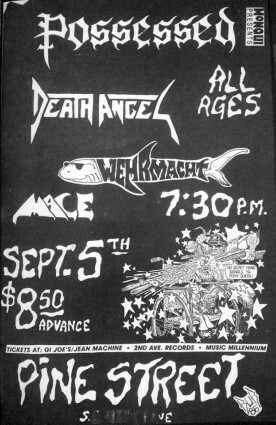 Death Angel, Dark Angel. 04/01/1986; Concert at The Adams Theatre, San Diego, CA, USA. 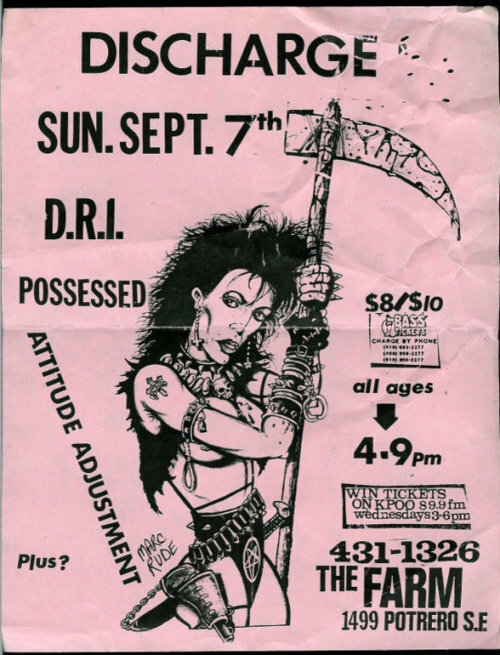 opening for D.R.I., with Dark Angel & Death Angel. 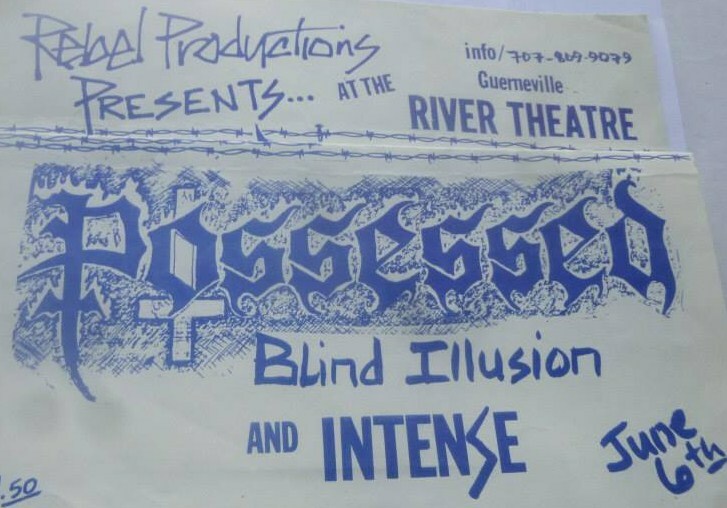 17/01/1986; Concert at The River Theatre, Guerneville, CA, USA. 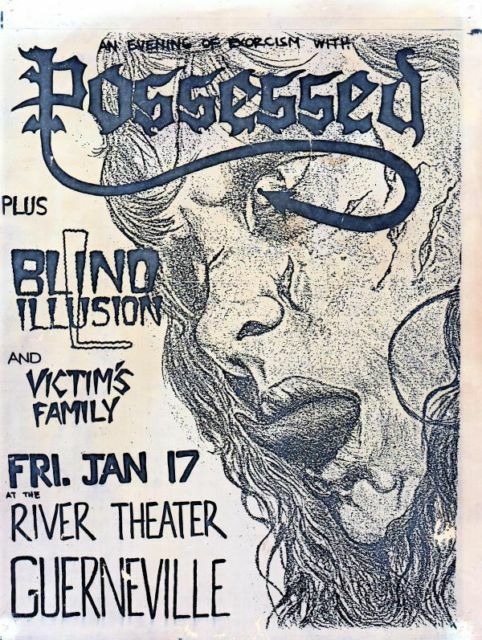 with Blind Illusion & Victim's Family. 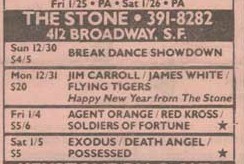 24/01/1986; Concert at The Rock, San Francisco, CA, USA. with Ulysses Siren & Insanity. 15/02/1986; Concert at L'Amour, Brooklyn, NY, USA. opening for Venom. cancelled. 25/04/1986; In Store appearance at 'Private Eye' records, CA, USA. 26/04/1986; Concert at The Olympic Auditorium, Los Angeles, CA, USA. 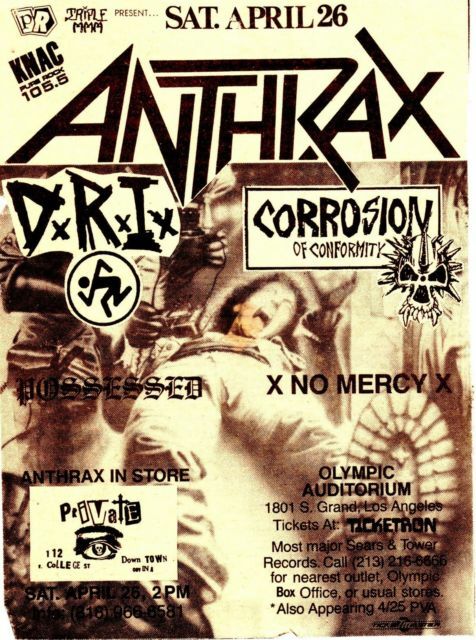 opening for Anthrax, C.O.C. & D.R.I. 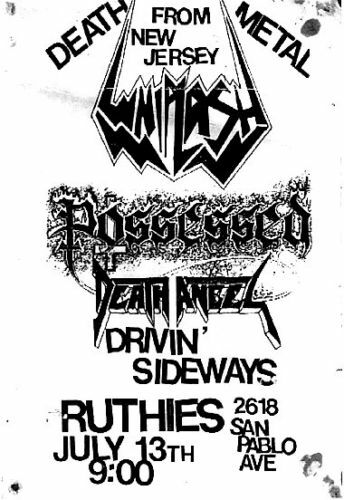 23/05/1986; Concert at Ruthie's Inn, San Francisco, CA, USA. 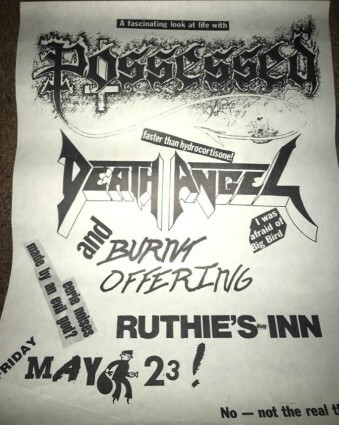 with Death Angel & Burnt Offering. 06/06/1986; Concert at The River Theatre, Guerneville, CA, USA, USA. 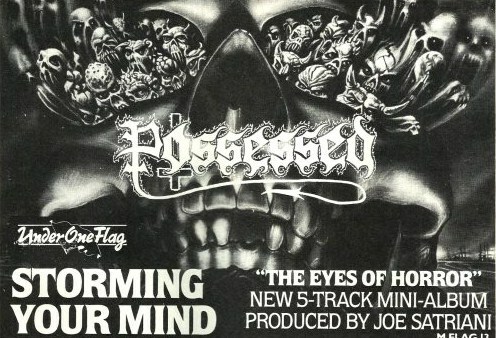 with Blind Illusion & Intense. 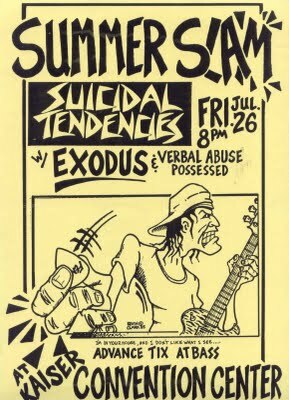 13/07/1986; Concert at Ruthie's Inn, San Francisco, CA, USA. 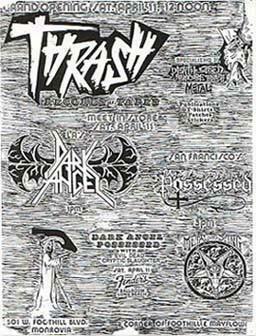 with Whiplash & Death Angel. (unsure of year). 09/08/1986; Concert at River Theatre, Guerneville, CA, USA. with Death Angel. 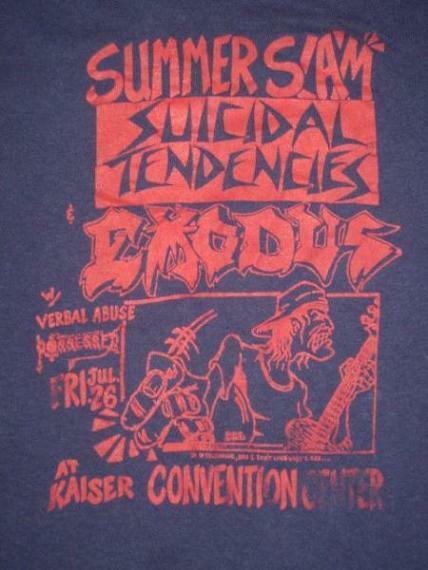 15/08/1986; Concert at Fenders Ballroom, Long Beach, CA, USA. 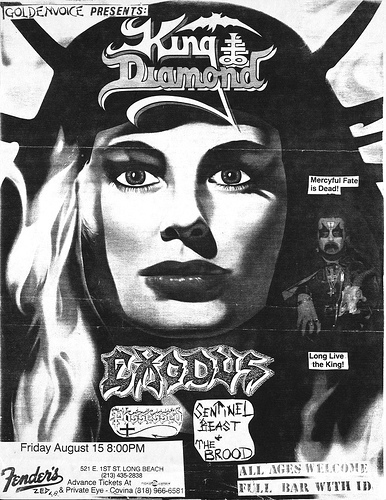 opening for King Diamond & Exodus, with The Brood. 05/09/1986; Concert at Pine Street Theatre, Portland, OR, USA. 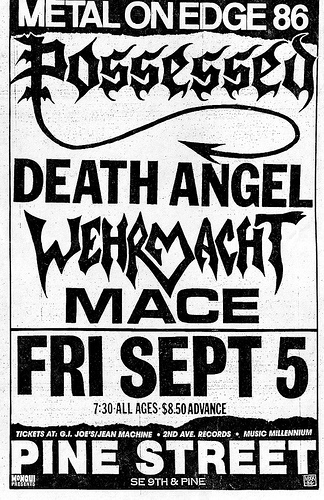 with Death Angel, Wehrmacht & Mace. 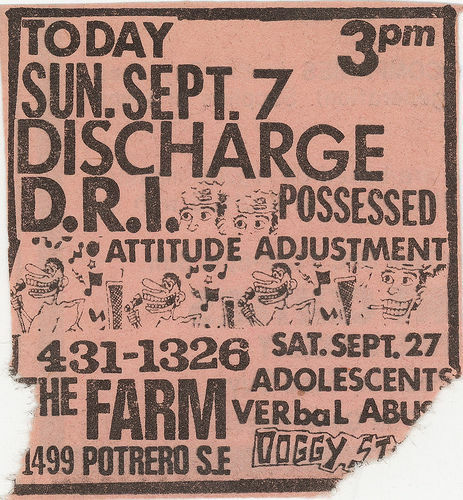 07/09/1986; Concert at The Farm, San Francisco, CA, USA. 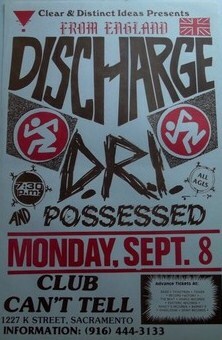 opening for Discharge & D.R.I., with Attitude Adjustment. 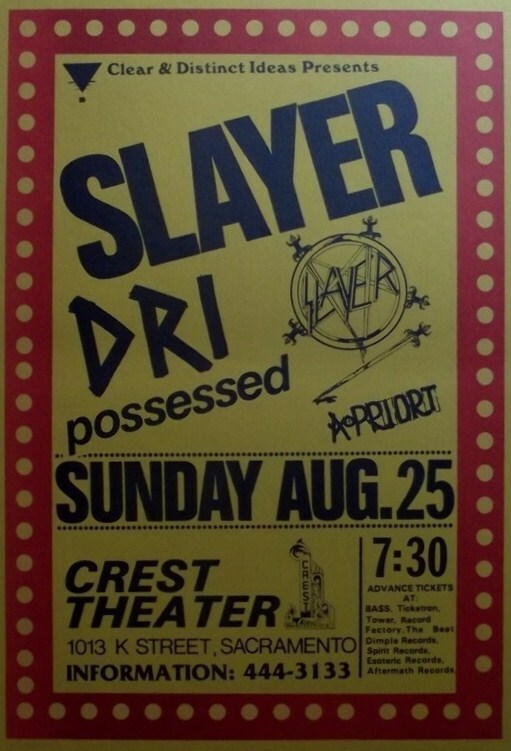 08/09/1986; Concert at The Crest Theatre, Sacramento, CA, USA. 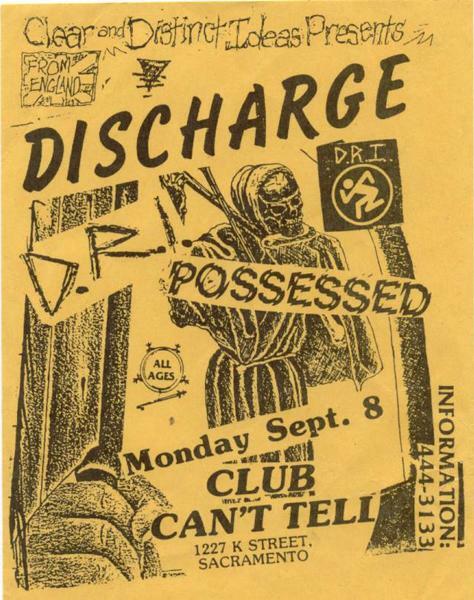 opening for Discharge & D.R.I. 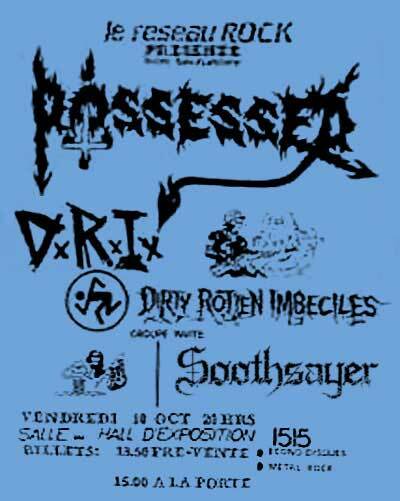 10/10/1986; Concert at The Hall D'Exposition, Quebec City, QC, Canada. with D.R.I. 12/10/1986; Concert at The Spectrum, Montreal, Canada. 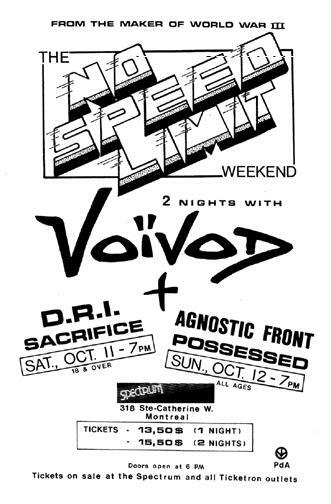 opening for Voivod, Nuclear Assault & Agnostic Front. The 'No Speed Limit' Weekend. 17/10/1986; Concert at L'Amour, Brooklyn, NY, USA. with Slayer. 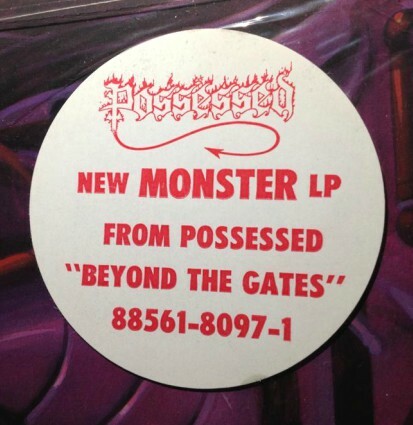 31/10/1986; 'Beyond The Gates' album released. 10/11/1986; Concert at The Markthalle, Hamburg, Germany. 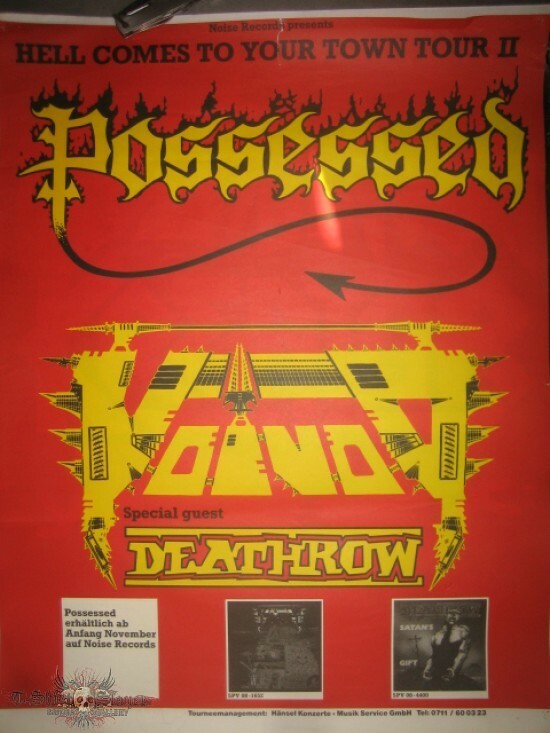 with Voivod & Deathrow. (Nov. 10th - 24th 'Hell Comes To Your Town' tour). 11/11/1986; Concert at The Aladin, Bremen, Germany. 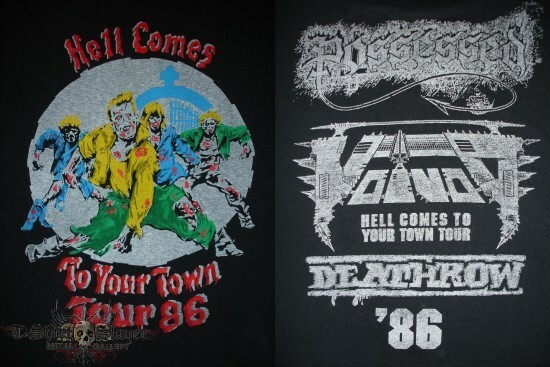 with Voivod & Deathrow. 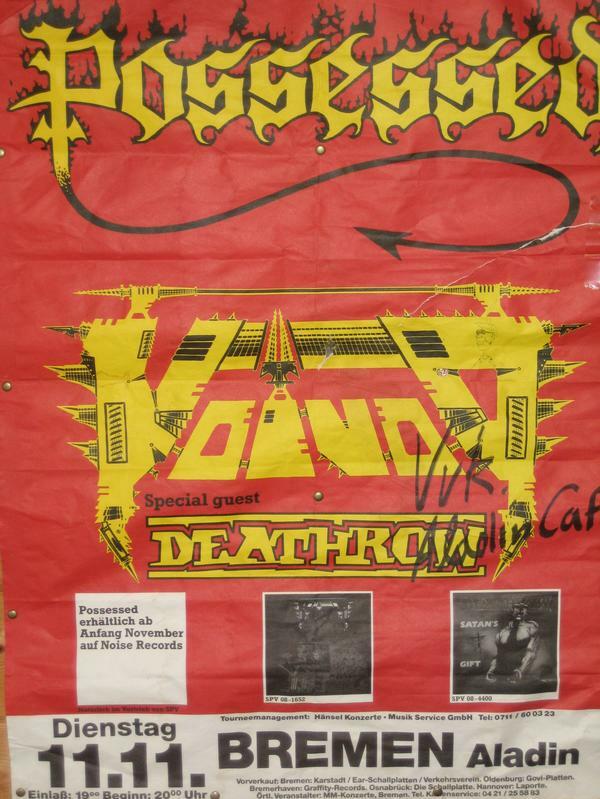 12/11/1986; Concert at Rockfabrik, Ludwigsburg, Germany. 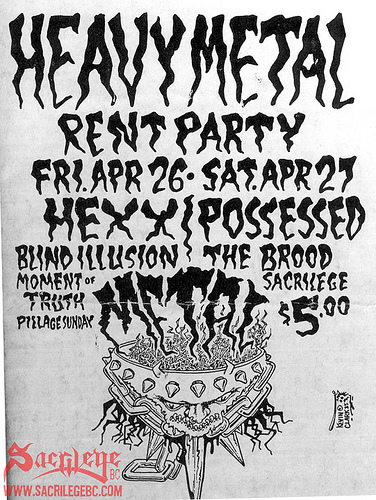 with Voivod & Deathrow. 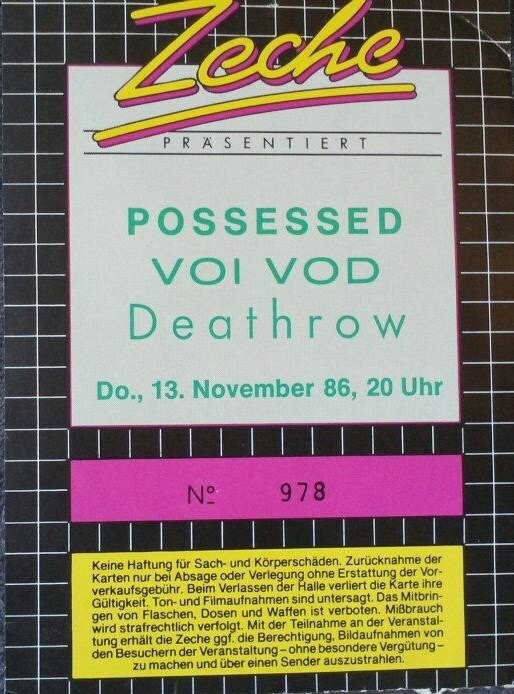 13/11/1986; Concert at Zeche, Bochum, Germany. 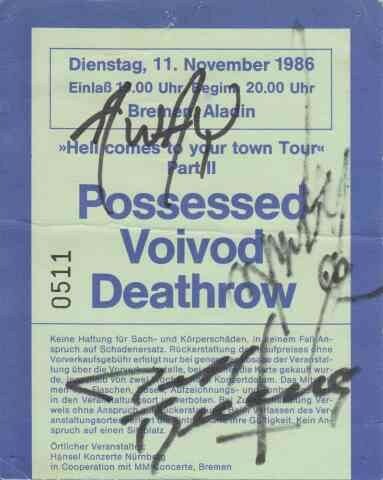 with Voivod & Deathrow. 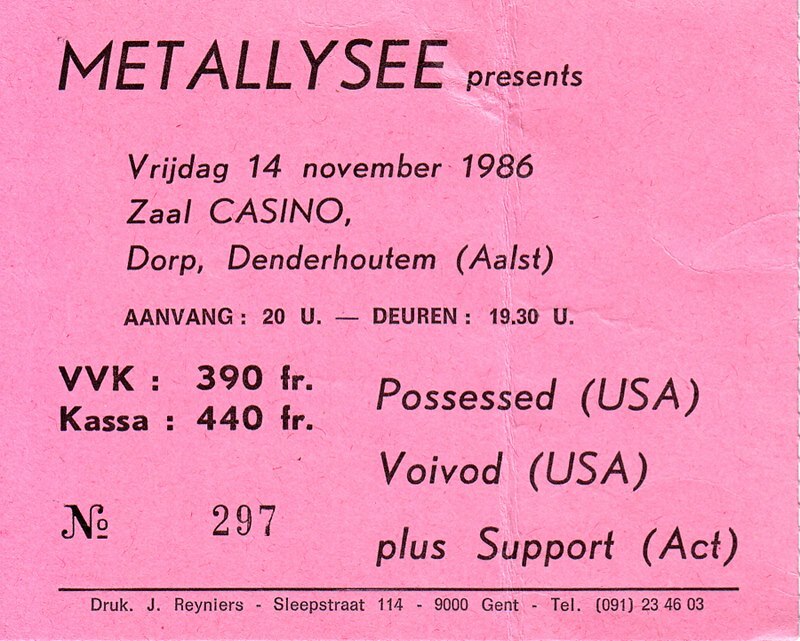 14/11/1986; Concert at The Casino, Denderhoutem, Belgium. with Voivod & Deathrow. 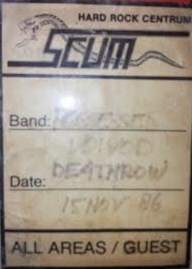 15/11/1986; Concert at The Scum Club, Katwijk, The Netherlands. 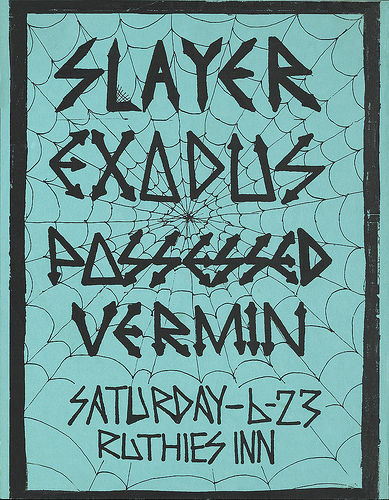 with Voivod & Deathrow. 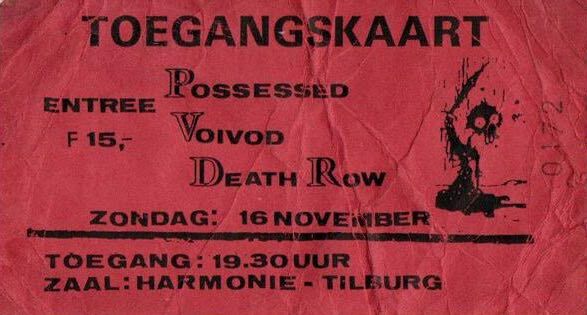 16/11/1986; Concert at Harmonie, Tilburg, The Netherlands. with Voivod & Deathrow. 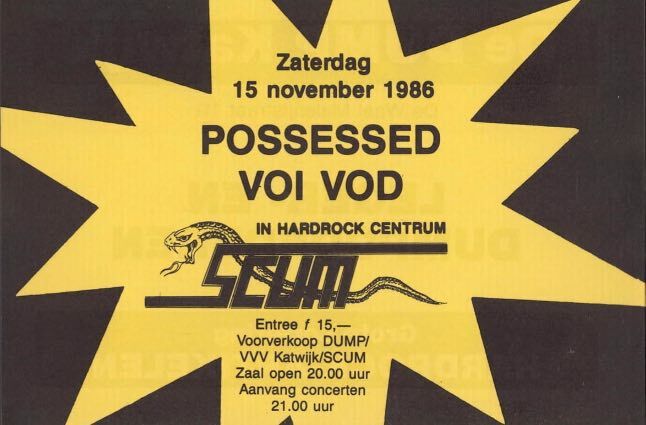 18/11/1986; Concert at ? ?, Neumarkt In Der Oberpfalz, Germany. with Voivod. 20/11/1986; Concert at Alabamahalle, Munich, Germany. with Voivod. 24/11/1986; In Store Appearance at 'Shades Records', London, England. 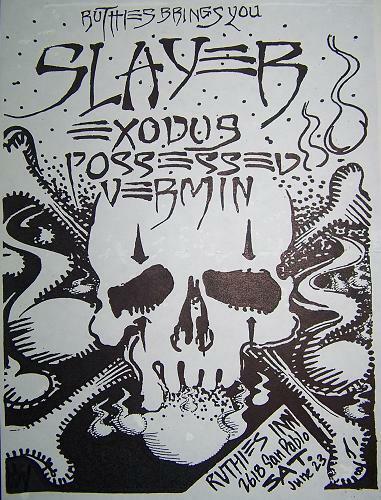 with Voivod & English Dogs. 24/11/1986; Concert at The Electric Ballroom, London, England. 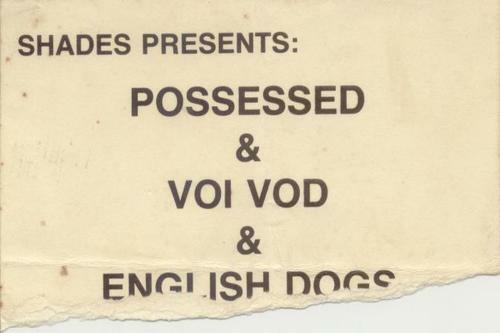 with Voivod & English Dogs. 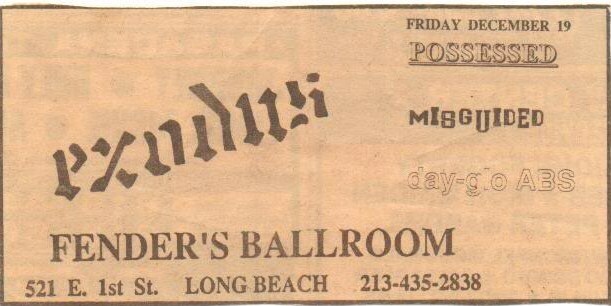 19/12/1986; Concert at Fender`s Ballroom, Long Beach, CA, USA. 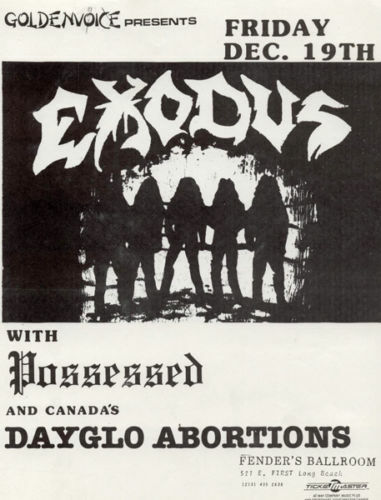 opening for Exodus. 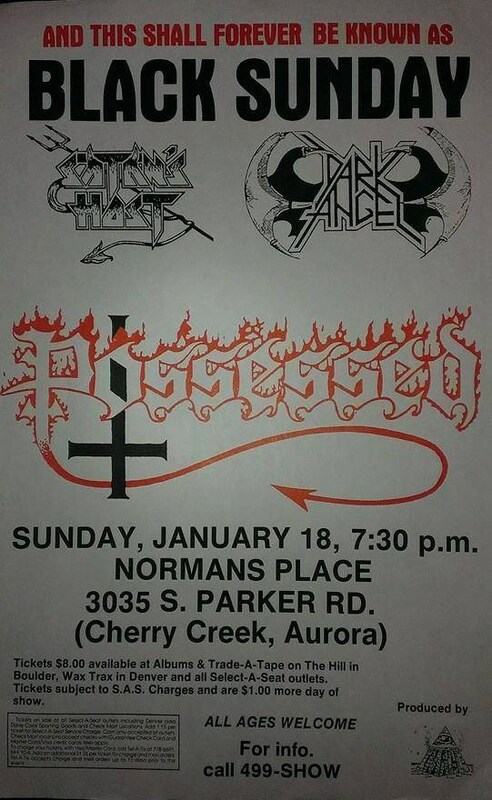 18/01/1987; Concert at Norman's Place, Aurora, IL, USA. 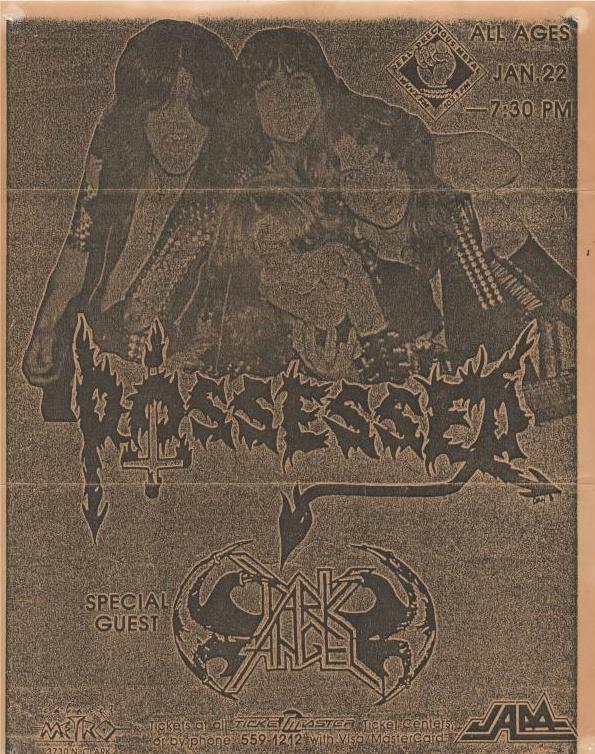 opening for Dark Angel, with Satan's Host. 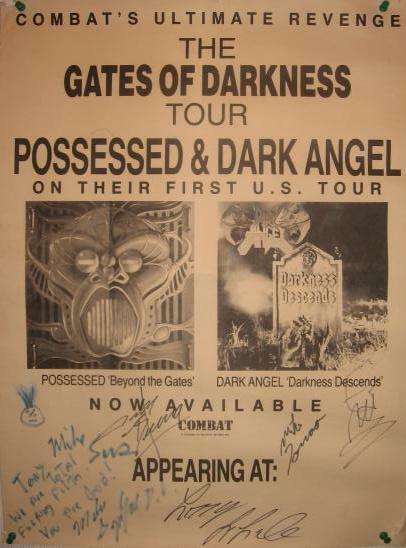 (Jan. 18th - Feb. 8th; 'Gates Of Darkness' tour). 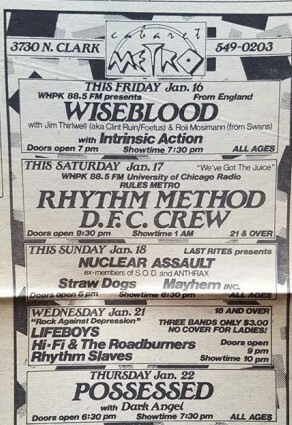 22/01/1987; Concert at Cabaret Metro, Chicago, IL, USA. 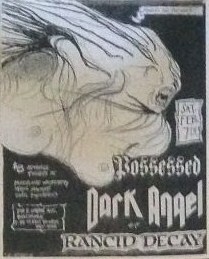 opening for Dark Angel. 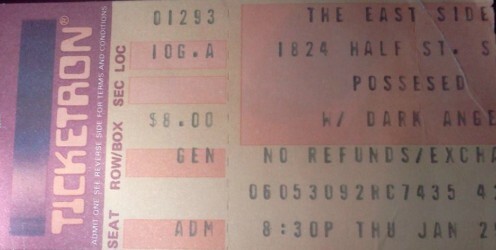 23/01/1987; Concert at Eagles Club, Milwaukee, WI, USA. 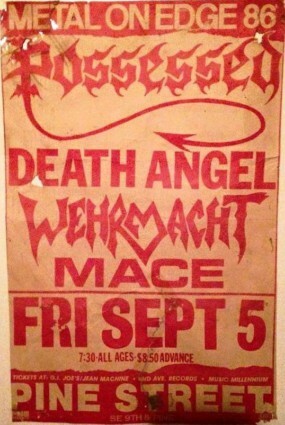 opening for Dark Angel. 24/01/1987; Concert at Blondie's, Detroit, MI, USA. 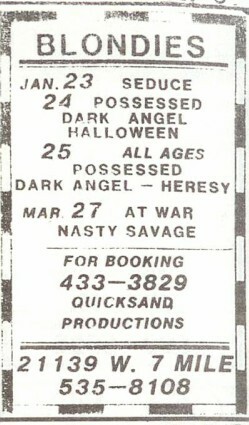 opening for Dark Angel, with Halloween. 25/01/1987; Concert at Blondie's, Detroit, MI, USA. 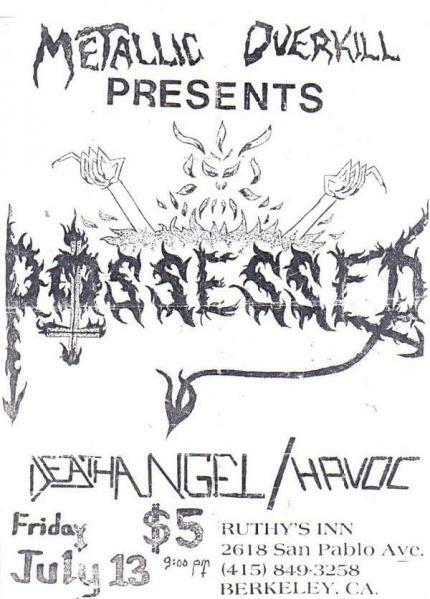 opening for Dark Angel, with Heresy. 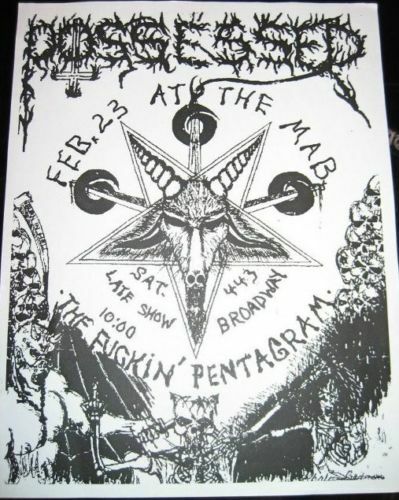 26/01/1987; Concert at Shadows, Parma, OH, USA. 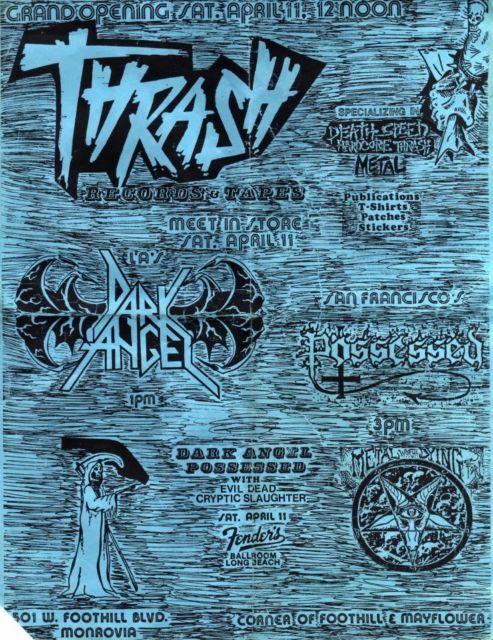 opening for Dark Angel. (released in 2004 as an official? 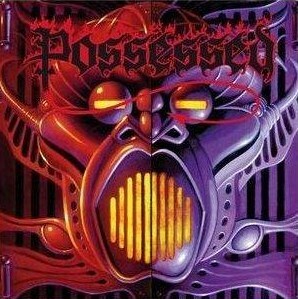 live album titled 'Agony In Paradise'). 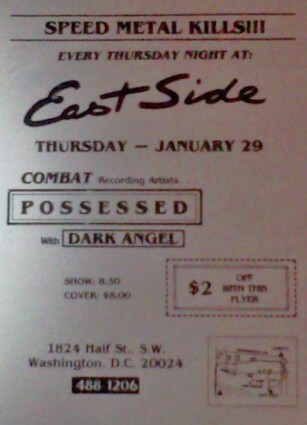 29/01/1987; Concert at The East Side, Washington, DC, USA. 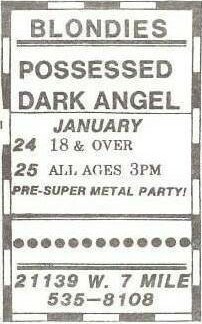 opening for Dark Angel. 31/01/1987; Concert at City Gardens, Trenton, NJ, USA. 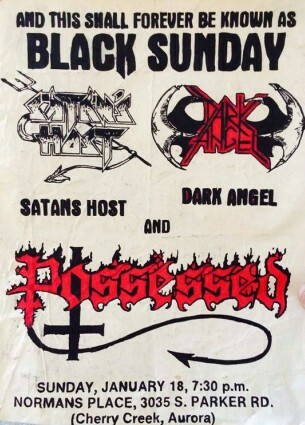 opening for Dark Angel. 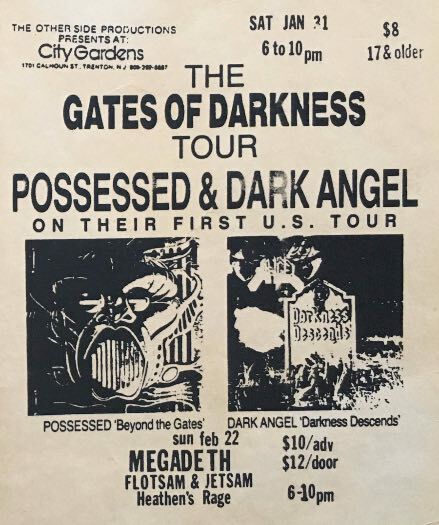 01/02/1987; Concert at The Paradise, Boston, MA, USA. 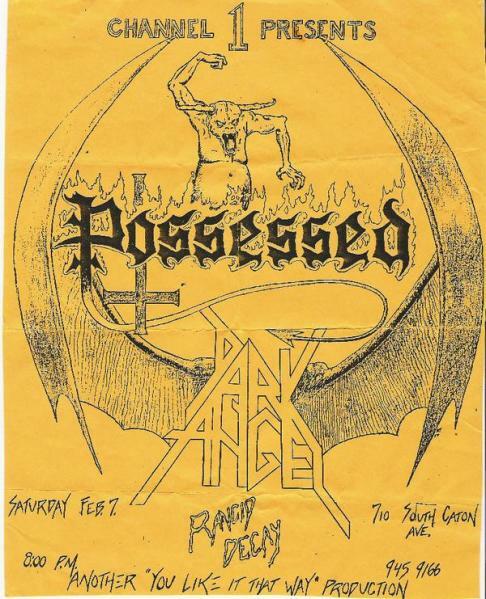 opening for Dark Angel. 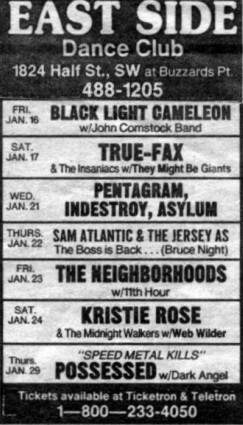 02/02/1987; Concert at Lupo's, Providence, RI, USA. 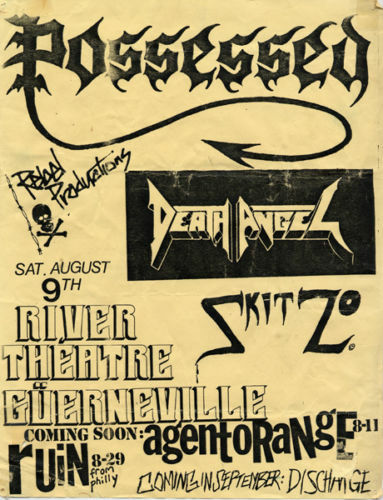 opening for Dark Angel. 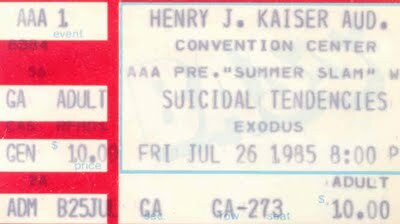 07/02/1987; Concert at Channel 1, Baltimore, MD, USA. 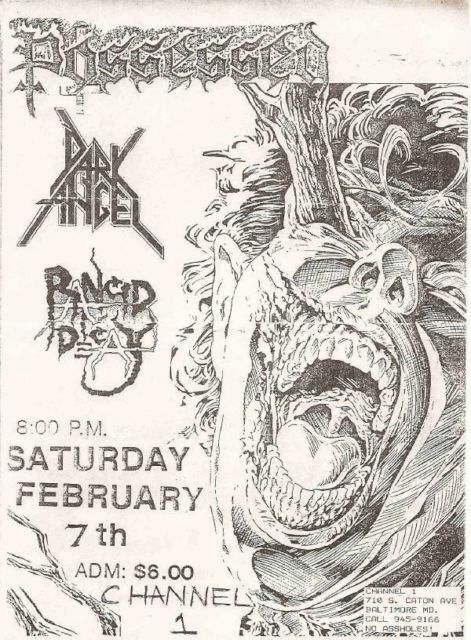 opening for Dark Angel, with Rancid Decay. 08/02/1987; Concert at CBGB's, Manhatten, NY, USA. 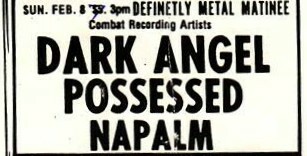 opening for Dark Angel, with Napalm. 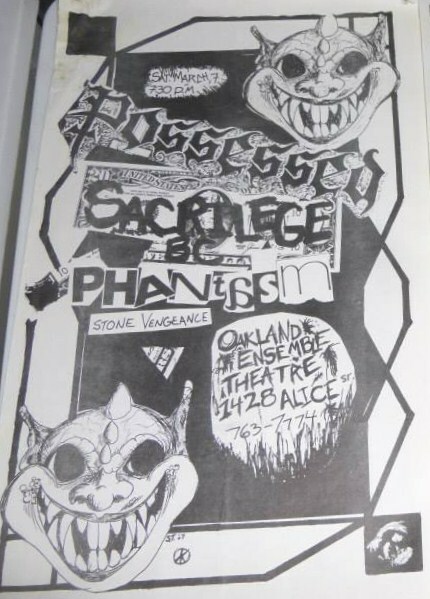 07/03/1987; Concert at The Ensemble Theatre, Oakland, CA, USA. 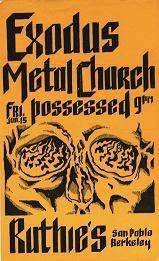 with Sacrilege, Phantasm & Stone Vengence. 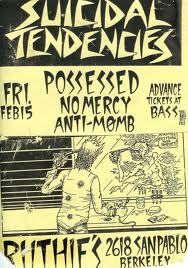 11/03/1987; Concert at Fender's Ballroom, Long Beach, CA, USA. 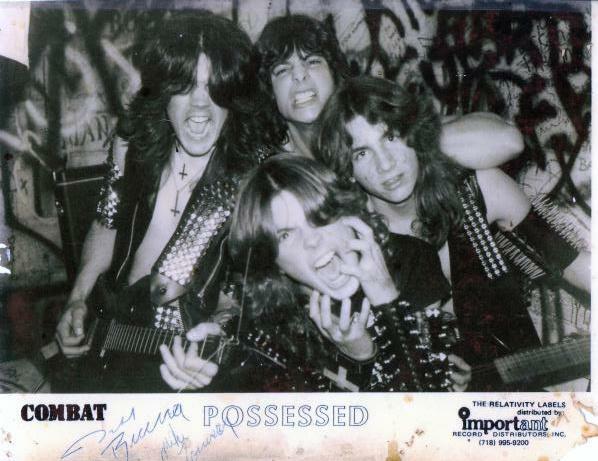 11/04/1987; In-Store-Appearance at 'Thrash Records', CA, USA. with Dark Angel. 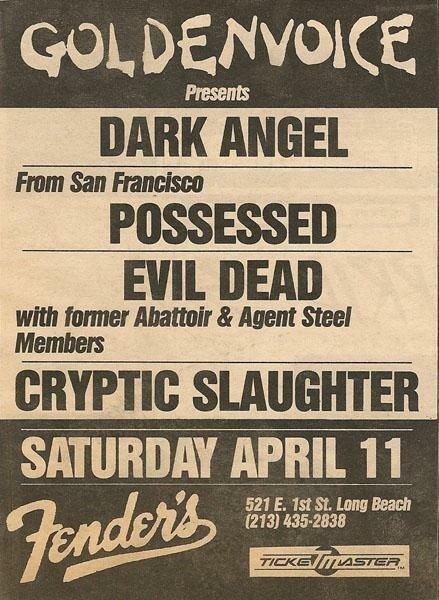 11/04/1987; Concert at Fender's Ballroom, Long Beach, CA, USA. 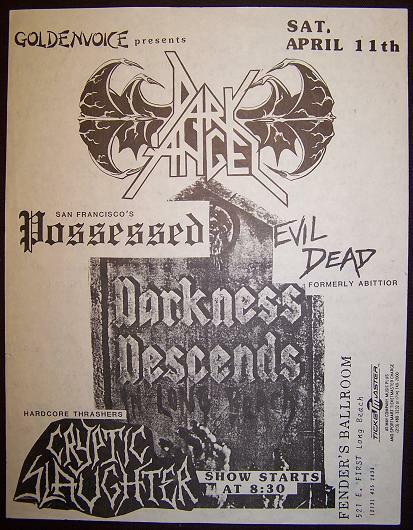 opening for Dark Angel, with Evil Dead & Cryptic Slaughter..
15/04/1987; Concert at The Stone, San Francisco, CA, USA. 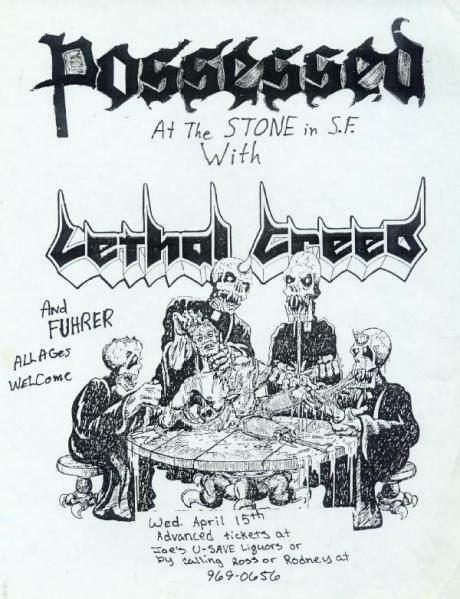 with Heathen & Lethal Creed. 11/05/1987; Concert at Celebrity Theatre, Phoenix, AZ, USA. 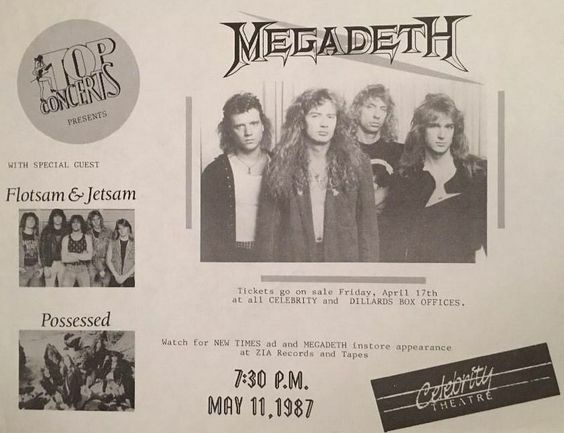 opening for Megadeth & Flotsam & Jetsam. 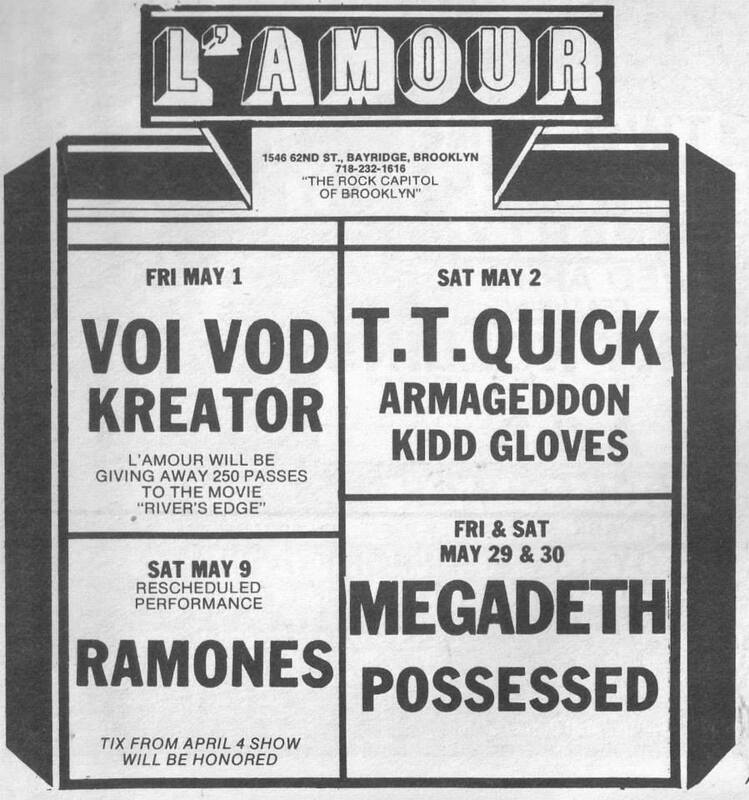 29/05/1987; Concert at L'Amour, Brooklyn, NY, USA. opening for Megadeth. 30/05/1987; Concert at L'Amour, Brooklyn, NY, USA. opening for Megadeth. 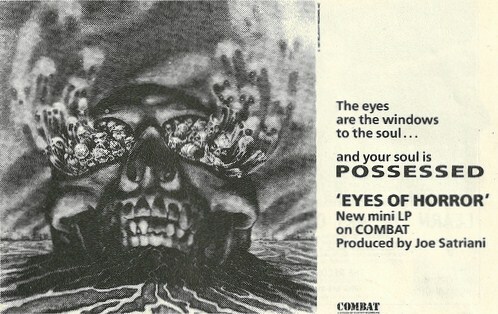 31/05/1987; 'The Eyes Of Horror' mini album released. 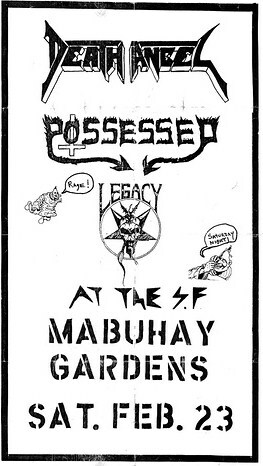 25/06/1987; Concert at Mabuhay Gardens, San Francisco, CA, USA. 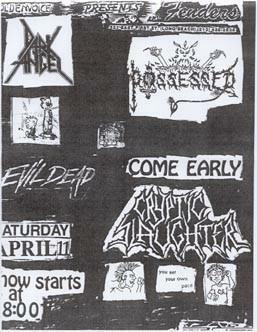 opening for C.O.C., with The Accused. (band probably had split by this time). 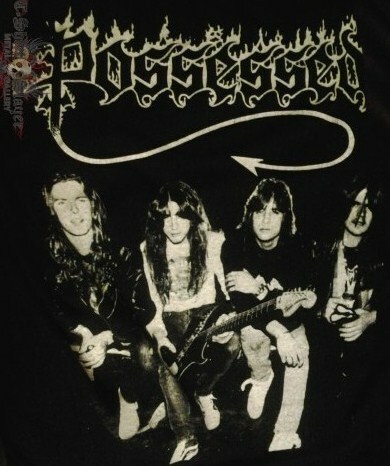 1987 - 1990 split up. ??/? 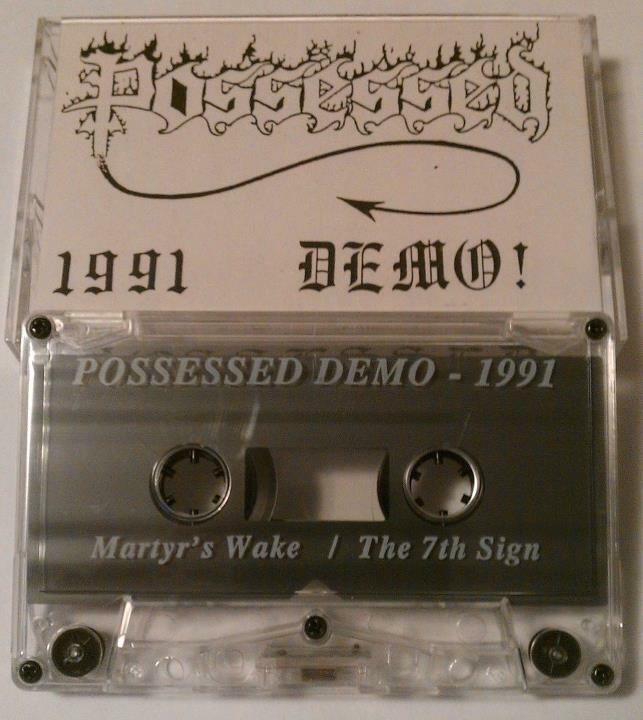 ?/1991; 'Martyr's Wake / The 7th Sign' demo released, Mike Torrao only original member. 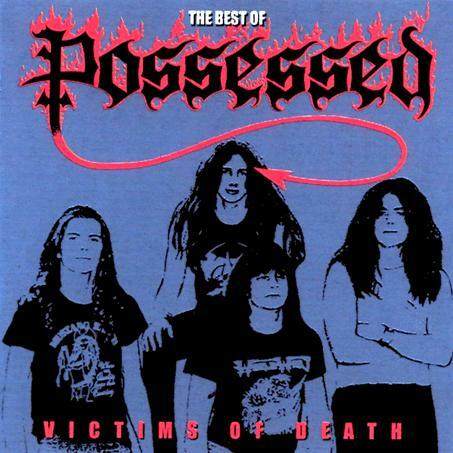 15/09/1992; 'Victims Of Death' compilation album released. ??/? 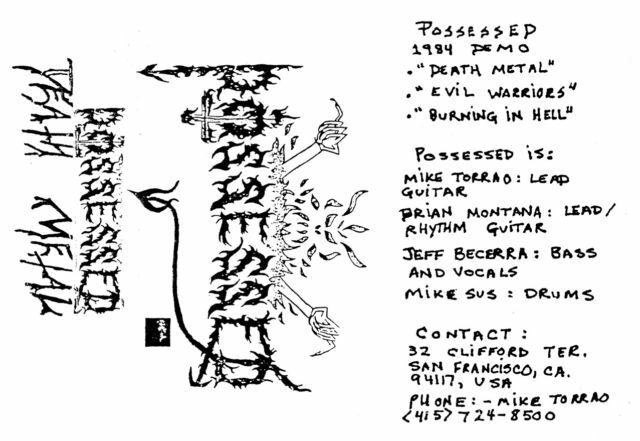 ?/1993; 'Possessed' three song demo released. date unknown. 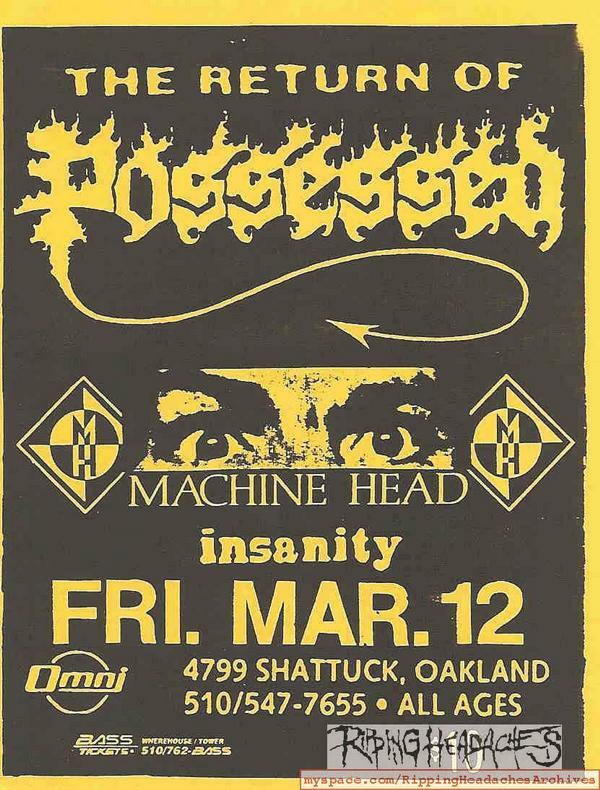 12/03/1993; Concert at The Omni, Oakland, CA, USA. 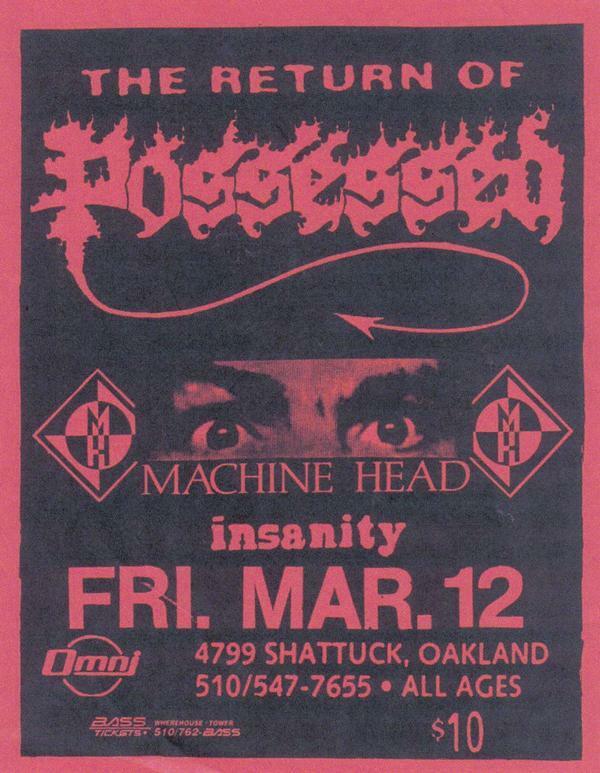 with Machine Head & Insanity. reunion / reformation show, Mike Torrao only original member. ??/? 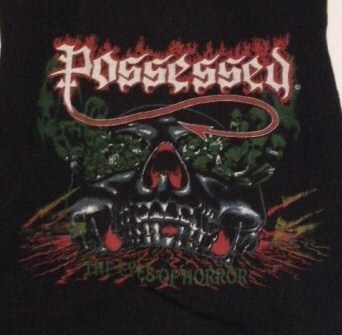 ?/1993; Concert at ? ?, Fresno, CA, USA. exact details unknown. 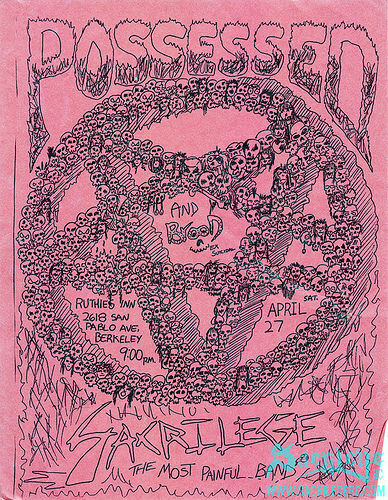 21/05/1993; Concert at Berkeley Square, Berkeley, CA, USA. last reunion show. 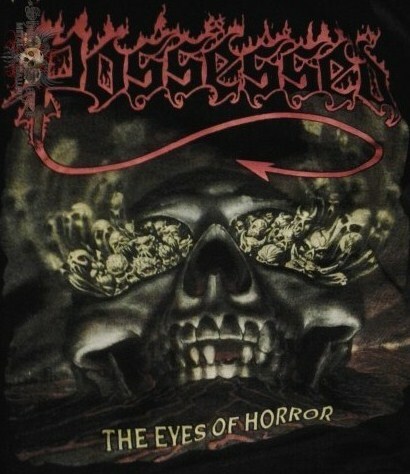 Possessed version 2.0 - 99 shows listed - 128 images - 13/06/2018.